Obtaining clear resection margins (RM) is a critical determinant of local recurrence in breast conserving surgery (BCS) for breast cancer. This nomogram calculates the probability of positive RMs based on five imaging or pathologic factors. Research authors: Shin HC, Han W, Moon HG, Cho N, Moon WK, Park IA, Park SJ, and Noh DY. A prospectively maintained database (Seoul National University Hospital Breast Care Center Database) was used. A total of 1,867 patients who underwent curative surgery for invasive breast cancer or ductal carcinoma in situ (DCIS) between January 2008 and December 2009 were retrospectively identified. 250 receiving neoadjuvant chemotherapy, 49 with unavailable preoperative imaging or pathologic results, and 534 undergoing mastectomy as their initial operation were excluded from the study. The remaining 1,034 patients who were scheduled for BCS were analyzed and their data were used to develop a nomogram. External validation of the nomogram was performed using data from another 563 patients with same enrollment criteria, who underwent curative surgery between January and December 2010 at the same institution. This nomogram was developed to predict positive resection margins. The nomogram was validated independently using a cohort of 563 patients who underwent breast surgery in 2010. The AUC of the validation cohort was 0.846 (95 % CI, 0.800–0.892). Calibration of the nomogram was assessed using an independent validation cohort. 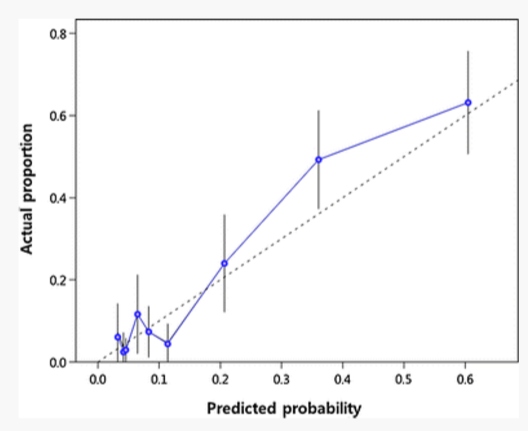 In general, the actual proportion of patients with positive resection margins and the predictive probability of positive resection margins were similar, according to the calibration plot.